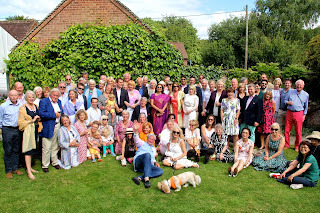 Herry's 70th birthday lunch was held at Old Swan House on Saturday 11th July 2015. 70 people came - about 20 family including all four children, and Prue and Thomas, but not Marijke and the girls as they had been at Christmas. Fortunately it was a beautiful day and everyone enjoyed themselves. Charlie Skipwith spoke for Herry and Herry in turn recalled absent friends. There was music from Do.It and catering was by John Robinson (with fish from Ashley Major at Thyme & Tides). Belin Martin did the flowers. The photo was taken by Robert Wu and included almost everyone who came, and Herry's neighbour Guy Boney as Lord of the Manor, also spoke for Herry.